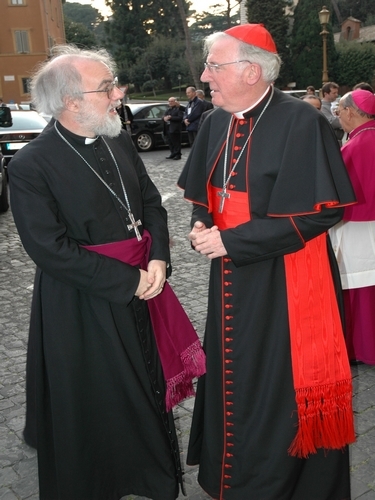 In advance of next week's private meeting between the Pope and Archbishop of Canterbury Dr Rowan Williams, the Anglican and Catholic bishops of England have met collectively for the first time since the Reformation. It was co-chaired by the Archbishop of Canterbury, Dr Rowan Williams and the Archbishop of Westminster, Cardinal Cormac Murphy-O’Connor. Described as being fraternal in character, the meeting was based on shared prayer, discussion and a desire for further development of shared Christian witness. A joint statement from Dr Williams and Cardinal Murphy-O’Connor said: “This historic meeting, forty years on from the visit of Archbishop Michael Ramsey to Pope Paul VI – the meeting from which the Anglican-Roman Catholic International Commission dialogue flowed – marks a further development in the warm relations that exist between the Anglican and Catholic Bishops in England and Wales. “We recognise the importance of working together to present a shared Christian witness to our society, and acknowledge the importance of working with other Christian denominations, and with those of other faiths to take forward the common good in society. “This meeting is a significant sign of our mutual commitment to dialogue and joint witness based on our common faith. It added: “Our Christian faith is rooted in our common baptism. However, our communion remains imperfect.